Jennifer has one of those symmetrical faces that we could just photograph for hours and hours. She came in for a model portfolio builder session with well planned several outfits and we clicked and clicked. She was also one of those rarer models that was very good with facial expressions and with her hands. We had a lot of fun photographing her, joking around and serious times too. You can view lots of images from her session here in her gallery on our website. I have blogged about this topic before, but here it is again...we always tell our models to spend five minutes three times a day practicing, just like a sport or an instrument you must practice. One five minute session spent on posing your hands, position your mirror so that you cannot see your face, jsut your hands, pose them gracefully, avoid the punched in the face pose, try expressing emotions via your hands, try to convey emotion via your hands without seeing your facial expression. The second five minutes later in the day is for facial expressions, how many can you do? Practice! The third session at a different time if full body posing, and we suggest that sometimes you try this naked, not that you will ever pose naked, but it takes away the pockets and such that you can use as props and crutches and makes you pose your arms and hands differently. It pays to practice! Here are just a few of the many expressions captured, this series was all with one outfit and background and they are great! Take a look in any fashion magazine and you will see how many expressions are needed. Need fodder? Start by thinking of the seven dwarves and move on from there. I had so much trouble deciding which images to post, the color, or the black and white since everything looks so good. I do like B&W images for portraits though, they just seem to say a little bit more. The images in this next just exude elegance. Her outfits were varied and they 'fit' her (style and personality) well. We really got to try out many different scenes with Jennifer, which made it an especially fun session! 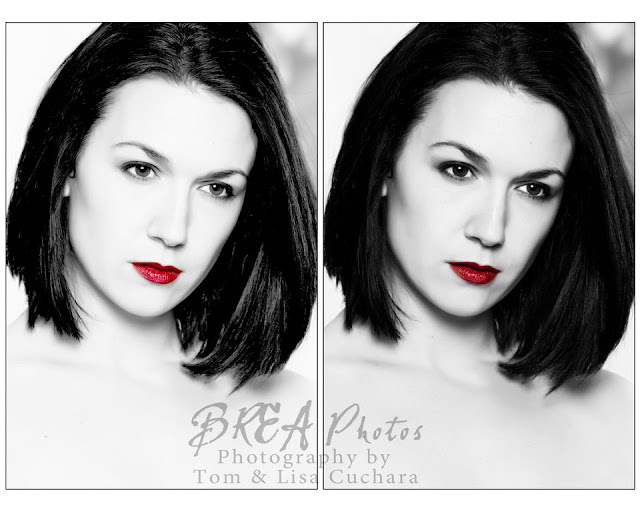 OK I cannot decide on which of these I like best, the one of the right has more detail and it gives more form to her face, but the one on the left shows her eyes more (she looks like Demi in that one) and has more contrast. What do you think? I guess I love both of them, but only one can go up on our Studio wall.